INDIANA -- Both of Indiana's U.S. senators met with Carrier executives Tuesday, and both left with the same answer: The decision to move to Mexico is made. Democrat Sen. Joe Donnelly and Republican Sen. Dan Coats both hoped to address United Technologies' (Carrier's parent company) decision to move 1,400 jobs from Indianapolis to Monterrey, Mexico. Carrier executives had already met with Gov. Mike Pence, to no avail. “During our meeting, I asked United Technologies executive Robert McDonough if the company would reconsider its decision to move Hoosier jobs to Mexico. He said he does not see a path forward—a response that I found both disappointing and frustrating," Donnelly said in a statement Tuesday. "He also laid out the reasons the profitable company is shipping jobs from Indianapolis and Huntington to Mexico. The primary reason was the company's desire to reduce costs by taking advantage of $3 per hour labor in Mexico. “What companies like United Technologies, Carrier, and UTEC fail to account for is the unique capability of American workers to make high quality products day in and day out, year after year," Donnelly added. "For decades, workers and their families have worked hard and been loyal to Carrier and UTEC, helping to build them into highly profitable and successful companies." 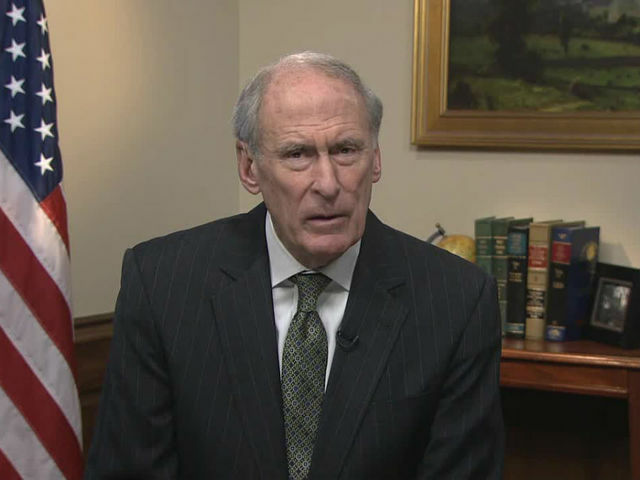 Coats said he "pushed" Carrier executives on their claims about federal regulations forcing the move. He sat down with RTV6 after his meeting with Carrier to talk about their response. 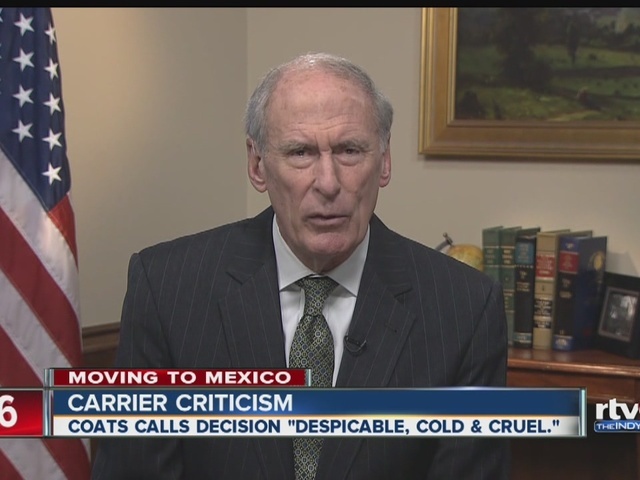 Carrier today met with Indiana Senators Dan Coats and Joe Donnelly in separate meetings to discuss its intent to relocate its manufacturing operations, as well as how best to support its employees throughout the transition. Discussions covered the factors that went into Carrier’s plan, including the steady migration of the company's competitors and suppliers to Mexico, as well as ongoing cost and pricing pressures driven in part by evolving regulatory requirements. Relocating manufacturing operations is the best way Carrier can remain competitive for the long-term. Even after this transition, Carrier will have more than 6,000 U.S. employees, including 400 headquarters, engineering and marketing jobs that will stay in Indiana. The company reaffirmed that it has not received and will not claim the $5.1 million federal tax credit, that it plans to repay state training grants and that it intends to work directly with state and local agencies on repayment of tax incentives. Carrier looks forward to continuing discussions with the United Steelworkers and to reaching an agreement that helps provide certainty and security for its Indianapolis employees. UTEC previously reached agreement with the International Brotherhood of Electrical Workers that will provide assistance and support to employees throughout the transition. Carrier appreciates the Senators’ time and will continue to communicate about ways to support employees throughout the transition. "Serious and candid: I just laid out my feelings on all this. The way they rolled this out, I think, was despicable. And they acknowledged it. It was a terrible rollout. And a disservice to the people who are working in the plant, and to Indiana. I tried to convince them … is there anything we can do to rethink this thing through? They made it clear that over this next three-year period of time they're going to be shifting out of Indiana. "The way they rolled this out was shocking. I've seen the video of it and it was cold and cruel and not empathetic at all. I feel for the workers and the impact of this. This long-time resident Indiana company is leaving. They had counted on a career there. Carrier needs to do everything they can in this transition period over three years to provide them with training, provide them with the right kind of pay, severance pay, transition pay, training, education, etc. I really laid it on the company saying, 'You've got a responsibility here.' Oh, plus, you've got to give money back to the taxpayer that Indiana put forward and that the federal government, the tax credits that they put forward. "I pushed them on [claims about federal regulations forcing them to Mexico]. It's more than that. They went through a number of reasons. I'm not sure how it all came down to federal regulations. It's clear under this administration we've overregulated business, we've over-taxed business. We’re not competitive around the world. And these are factors, but it's only two of several factors, and they acknowledged that. There's some responsibility the federal government has to bear here. Under the Obama administration the energy department, and other agencies, have doubled-down on ideological decisions, environmental purity decisions, that don't take into account cost-benefit, don't take into account jobs people have, and that needs to be changed. But there's more involved in this with Carrier. "We live in a global economy now. These things are going to be produced and the company with the lowest price is going to be able to sell their product. And so, it's more complicated than anything Donald Trump puts out. I know he touches a raw nerve on this, and yes, this is an issue to look at, but there's more complexity to this issue in a global economy when people can make these things in Europe or make them in Mexico or make them in China and then go to Walmart or wherever and sell them for a much cheaper price, which benefits the consumer. The problem with Donald Trump is he says things that trigger people's emotions but he doesn't have policies to back up, in terms of whether or not it will work. And so, that's what we're going through with these primaries."